Support Parents in Passing on the Faith | Donate to AFC's Mission Today! We invite you to join us in our mission by contributing to the renewal of the lands and facilities that over 100,000 faithful have come to encounter God’s presence, love, and mercy. Click on the tabs below to learn more. 1. Installed LED lighting in Vianney Center lobby, as well as some outdoor lights. 2. Installed air conditioning unit in Vianney Center Chapel. 3. Painted portions of Kateri Room and installed window blinds. 1. Installed new flooring in main entrance to shipping and duplication and office cubicles. 2. Painted main entrance to shipping and duplication and offices. 3. Installed new emergency exit door from office area to deck. 4. Constructed deck and fire escape from second floor. Finished painting, and installed light fixtures and carpet throughout. Constructed several lean-to storage buildings for supplies and equipment. All of these changes will make a huge impact on the efficiency of our work at our core administrative and support facilities. Vianney Center—Give Kateri Room a facelift (paint, new carpet, ceiling treatment, new light fixtures). Sacred Heart Center—Dorm Wing—Install interior signage and upgrade fire protection system. Redeemer Hall—Complete first phase of hallway upgrades (wall treatments, painting, flooring). Install new carpeting in select areas. St. Joseph Workshop—Complete lean-to project. St. Joseph Auditorium—Make incremental upgrades to the A/V system. These are not exciting, but they are absolutely essential. This is a very obvious area of need that requires real focus. Modest upgrades have been made for select men’s and women’s restrooms—such as painting, toilet partitions, and showers in Sacred Heart Center—but much more is needed throughout the property. Roadway and parking improvements can no longer be deferred, as paved areas are deteriorating quickly and are past their life expectancy. Restrooms throughout the property are in desperate need of attention. St. Joseph Auditorium—This highly used facility has no permanent restroom facilities. St. James Field—We need to construct a second bathhouse to serve this 72-cabin area. Holy Family Park—Bathhouses were last upgraded in 1998 and have not been touched since. Redeemer Hall—Restrooms and sanitation treatment facilities are in great need. Every summer we turn families away when our Holy Family Fests reach 150 families and we run out of housing. Based on historical data, we know that our infrastructure, with only modest upgrades, can accommodate an additional 50 families. This 33% increase in event attendance would greatly impact our revenue-generating capability and our ministry outreach potential and would enable our facilities to operate at full occupancy. The following projects will create 50 cabins and 26 retreat rooms. The cabins will enable 50 additional families to participate in our events, and the retreat rooms will house additional support staff (priests, volunteers, and speakers). 1. 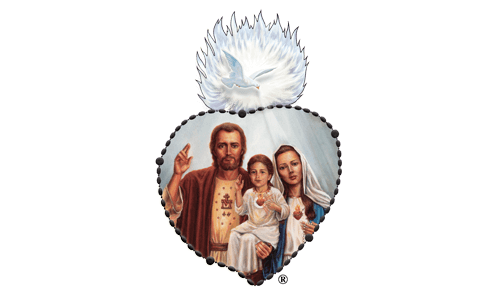 Sacred Heart Center—Convert offices into retreat rooms (15 rooms). 2. Vianney Center—Construct office annex to free up retreat rooms (12 rooms). 3. St. James Field—Construct 26 year-round cabins (with plumbing and kitchenettes). 1. Completed installation of baseboard, vanities with sinks, lights, ceiling fans, and mirrors. 2. Renovated second floor restroom. b. Installed new toilets, sinks, and toilet partitions. 3. Painted main entrance and end entrance lobbies and stairwells. 4. Installed new carpet and flooring in: second floor retreat rooms, hallways and main entrance lobby. Begin more detailed planning for St. James Field and Holy Family Park cabins. buildings require significant modifications to accommodate community living. Two residences have already been renovated for the Catholic Corps Men. These changes included: bedroom and bathroom additions, paint, updated furniture, and the creation of a chapel space in each home. 2. Installed a half bath on first floor in former closet. 3. Installed washer and dryer on second floor. 4. Installed spiral staircase to attic living area. 5. Renovated first floor living areas and chapel. 6. Graded yard for future recreational use. 7. Lowered driveway for better drainage and installed french drain to protect the house. Created a 3 car parking area. 1. Constructed a chapel and three new bedrooms. 2. Installed a washer and dryer. 3. Redesigned the great room. Installed new furniture and rugs. 4. Built a 10×12 patio cover at the exterior entrance to the great room. The Catholic Corps Women still need to be provided for. Currently, 12 women share a home built for a family of 6–8 people. Another house will need to be built for their community, since there are no more unoccupied residences on the property. Providing additional housing for the Catholic Corps will enable their communities to more readily welcome new vocations, helping the AFC’s mission to continue for years to come. JPII House— Complete finishing touches to JPII House: Install a porch cover, barbecue grill, and a railing at the top of the spiral stairs. Fatima House—Install an additional bedroom on the top floor. Modify the master bathroom to be accessible for general use. Install new carpet and kitchen flooring. Construct an additional house for the Catholic Corps Women. 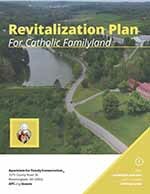 A unified landscaping plan would beautify Catholic Familyland’s grounds, which extend to 803 acres and include a large number of gardens, decorative and shade trees, and freestanding signs. Last year, we consulted several landscape architects and created a master plan for the entire property. Progress was also made by cutting down dead trees and planting new ones in several areas, and renovating the gazebo in the Rosarium Gardens. Further implementation of the unified landscaping plan includes constructing or repairing the many signs that aid families in finding their way around this extensive property, as well as planting additional shade trees near cabins and sporting facilities. We also need to add more water sources, to enable easy access for maintaining plants around the property, and to repair the statues found in several outdoor prayer spaces. to support that experience and give families a wider variety of activities to choose from while they are at CFL. This spring, we made progress in this area by assembling two rand-new commercial playhouses at Holy Family Park, but those are not the only amenities we want to add. The options for expanding our spiritual and recreational offerings are endless, but we have a few ideas. Adding a splash pad at Holy Family Park would take pressure off the crowded swimming pool and give both parents and kids another fun place to hang out on hot summer afternoons. We also hope to construct a pavilion that can be used for outdoor Masses and other events.